The early Airfix sets were quite poorly sculpted by modern standards, and all were either remodelled a few years later, or dropped from the range, never to reappear. The Japanese infantry was one of the first sets to be of high enough quality to still be in production today. 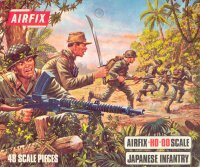 Airfix seem to have had a number of favourite poses that occur many times in different sets. For example, the figure running and waving his rifle high in the air (for no reason that we can think of) is also seen in the Bedouins set. However, the poses here are mostly well thought out and appropriate to the subject. Amongst the normal types there are several figures kneeling or prone, which is as it should be for any World War II infantry set. The flag-bearer may seem out of place for the period, but many photographs show full size flags being displayed on the battlefield. The bugler and officer advancing with sword are again correct and unique to the Japanese army. Japan invaded Manchuria in 1931, and was at war continually from that year until the final surrender to the Allies in 1945. Consequently by 1942 the uniform was very practical and simple. All these figures wear the very common type 98 uniform, which was introduced in 1938. Where helmets are worn they are of the standard pattern, but the majority wear their field caps, though only one is also wearing the sun curtain which was made of four pieces of cloth hanging down the back of the neck. They all wear puttees, but the canvas straps that were normally wound round them to form the characteristic 'X' pattern have not been sculpted. Most have the characteristic pair of cartridge pouches on the front of the belt, although these have been sculpted extremely small, but only a few (mostly the prone figures) have the larger pouch attached to the back. Other equipment is a realistically mixed bunch, although several seem to be carrying over-large haversacks, and most are not encumbered with large packs etc. which would be a considerable burden when fighting in jungle terrain. Weaponry is mostly rifles, though one man carries a light machine gun. This is a surprise as Japan made very few submachine guns, so they were very rare in the field. The only model made in any quantity, the Type 100, was not made in large numbers, yet the model on this figure is definitely not the Type 100, so this is presumably a captured weapon, but we could not identify it and would rather the designer had left it out. No figure has fixed bayonet, and indeed none have the bayonet frog except the prone machine-gunner. This man is firing what appears to be a type-11 machine-gun, which surprisingly did indeed come with a bayonet, through how effective such a heavy weapon would be in hand-to-hand combat can best be imagined. The bugler, flag-bearer, falling casualty and hand grenade thrower are all unarmed. The officer brandishes his sword, which could easily be a family heirloom of considerable age, or it may be the traditionally shaped Type-94 shin-gunto that was introduced in 1934. These are remarkably good figures considering their age. The examples we scanned are exhibiting some loss of detail in places, but the recent reissues from Heller seem just as sharply detailed as the first batch ever made. Also, the apparent flash on the scanned figures was not repeated on the more recent reissues. Had the men been given tropical uniform they would have been even more popular for the warmer parts of the campaign in the Pacific, although as they all wear the tunic there are still have plenty of situations where they would be appropriate. These may not be the best Japanese infantry ever made but they are very good nonetheless and worthy of their popularity over the years. Note that the layout of this set changed. When originally released there were four of the prone firing rifle pose, and no prone machine gunner. Early on in the 'blue box' phase Airfix removed one of these riflemen and added the machine gunner, giving us the lineup we see today and as pictured on this page. Curiously the fourth prone rifleman briefly made an appearance in the first type German Infantry set!